faith as a human creation..."
celebrations of spiritual and social values." - from frontispiece, SOF Magazine no 15, October 1993. SEA OF FAITH NETWORK started in 1984 as a response to Don Cupitt's book and TV series of the same name. The Network has no creed. It welcomes people from all religious and humanist traditions. It has an annual conference, local groups, a newsletter and a quarterly magazine, Sofia. "Madeleine Bunting writes that religion has a contribution to make to the debate about how we want our world to be. The next question is what kind of religion. For centuries in the English radical tradition, often using theological language, the struggle for justice has gone hand in hand with the struggle to desupernaturalise God. Sofia, the magazine I edit, explores religion as a human creation for better or worse. Like the poet Blake, I believe that gods and religions were created by the human poetic genius. Religions have been used as tools of repression and as ideological support for arrogant worldly powers. "But as huge products of the human imagination, gods and religions are also a vital part of our common culture, an important way of exploring our own humanity. I believe that the Christian epic story of salvation and the final coming of heaven on Earth is an imaginative portrayal of a humanist project for justice and peace. Twenty-five years ago liberation theology had a very fruitful input into the Sandinista project in Nicaragua, which promoted a "sane and kindly humanism" and struggled to construct a fairer society. With discernment, some forms of religion can still make a vital contribution to our debate about what to do now in a troubled world." The Reverend David, Anglican priest, sent this letter to the Guardian recently. It wasn't printed (most of his letters are), but it's well worth reading. 'Thank you for your editorial " Disappearing Christianity" on 28th May (and 'Loose Canon' the previous day). Talk about the prevalence or otherwise of religion should be about more than Christianity, or even Christianity and Islam. Morality is by no means the sole prerogative of the monotheist religions, and while the development of Human Rights might well be traced through particularly humanist forms of Christianity, other more dogmatic or fundamentalist forms of Christianity and other faiths have bitterly opposed them. The test is in the common good. A society consumed with greed and violence, as ours so often is, needs the challenge to love one another, and some of the most powerful challenges are enshrined in the religious traditions of world history. Our age needs the gods of love, mercy and peace which we humans have made for ourselves, but not the gods of dogma, greed and war. Ian Quayle (letter, 26 November) suggests that church members who agreed with Chris Beney (letter, 25 November) could no longer call themselves "Christians". Members of the Sea of Faith network have for more than 20 years been exploring and promoting religious faith as a human creation. I accept the label of Christian as well as Humanist and see no contradiction. It is perfectly possible to follow the teachings of Jesus, who taught about bringing God's Kingdom on Earth, without my having any belief in an interventionist God or an afterlife. To me, God is a metaphor for the sum of my highest values and their creative power, and Jesus a man who personified these values. The idea of God is real, even if (s)he is not. I find it perfectly logical that I attend my local church with my fellow Christians, each exploring the consequences of their belief in their own way. I am glad that the CofE is still broad enough to find room for me and those who think as I do. In his letter on religious broadcasting (31 July), Nigel Holmes refers to Mark Thompson's comment that there is prejudice inside broadcasting based on the presumption that 'religion is boring'. Of course, every subject has the potential to be boring if approached without imagination and creativity. In 1984 the BBC took the courageous decision to broadcast 'The Sea of Faith', a six-part series in which the philosopher, theologian and Anglican priest, Don Cupitt, surveyed western thinking about religion and charted the transition from traditional realist religion to the twentieth-century view that religion is simply a human creation. The series was very well received and Don Cupitt received a deluge of correspondence from viewers, many of them thanking him for providing them with a way in which they could continue to practise their religion in the modern age. Inspired by the positive response to the TV series, a small group of radical Christian clergy and laity began meeting to explore how they might promote this new understanding of religious faith. This initiative led ultimately to the creation of the Sea of Faith Network, an organisation whose members wish to share in the mission to explore and promote religion as a human creation. In recent years the Network has endeavoured to broaden its field of interest to faiths other than Christianity. In July this year the Network held its 29th annual conference and in September will publish its 117th quarterly journal. Surely it is time for the BBC once again to take the lead and to produce some controversial and ground breaking programmes which give new insights into religion today and prove once and for all that religion, far from being boring, is one of the most interesting topics know to humanity. has been re-issued as a free e-book in PDF format. Download and read it now! 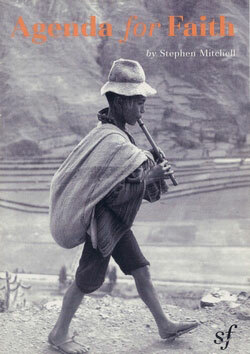 Stephen Mitchell's original 'Sea of Faith' book, Agenda for Faith, has been re-issued as a free e-book with a new introduction. 'The Nontheist Friends Network' members are fellow-travellers with the Sea of Faith Network. (Click this link to explore their website). 'Sea of Faith' fellow-traveller, Michael Wright, is Clerk of the Steering Committee of the 'Nontheist Friends Network', a network of Quakers who regard religion as a human creation. He has written a response to a Theist Quaker academic, Ben Pink Dandelion's lecture and book 'Open for transformation: being Quaker'. 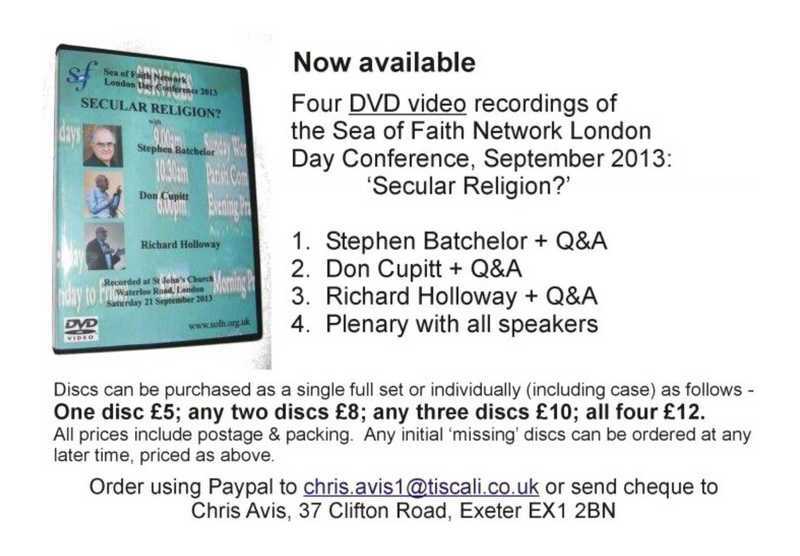 "I was religious but now I'm..."
"The freedom to be tomorrow what we are not today"
4 DVD Video Recordings of this Conference are now available: £12 by PayPal, credit card or cheque (payable to Chris Avis, not Sea of Faith). New book by Dinah Livingstone. What is the point of poetry? And why with our poetic genius do we create a whole imaginary supernatural realm? Isn't it enough for humankind to be rational animals, or try to be? Why are we also poetic animals, and need to be? Looking closely at various poems, this book explores poetry and theology as sister arts. It believes that poetic vision and kindness are the making of humanity. Available now from the publisher KATABASIS. Read editorial and articles from the latest edition of Sofia magazine.